Tougher deportation rules are tearing up families without ushering in broader reforms. On the night that Shahed Hossain left his family’s house in Haltom City to drive to Laredo, his mother, Habiba, cooked dinner — chicken and rice, with okra picked from the garden. She piled her son’s plate high and watched him eat. Then she took his Bangladeshi passport from a drawer and handed it to him, leaving his green card safely stored away. The 21-year-old had a penchant for losing things, and a green card is not a thing to lose. She hurried him out the door and into the white utility van in the driveway where his boss waited. “I’ll see him in a week,” she thought. Like every other time he’d set off for work trips all over Texas, she figured, her younger son would return to that house where he grew up with his brother and his parents and the dog. But that night was the last time Shahed Hossain’s mother would see him free in the United States, the last time she’d have a chance to worry he’d lose anything. Six days later, Hossain was locked up in a privately run immigration detention center near the U.S.-Mexico border. He spent more than a year there, a period he’s tried to forget, before he was shackled, loaded onto a plane, and flown to Dhaka, Bangladesh. Hossain is Texan through and through. He walks with a swagger and speaks with a hint of drawl. He and his best friend passed middle school evenings scurrying down to the creek to catch turtles, and on high school weekends, when they weren’t working at the ice cream drive-in, they’d escape the suburban lull to go fishing for gar in the Trinity. He played freshman football and dated a young woman named Erika Fierst, whose mother is an accountant for a major defense contractor. But Texas is far away now. Hossain finds himself living with his grandmother, passing solitary days raising carrier pigeons, growing an orchid garden, and searching for work, mostly in vain. 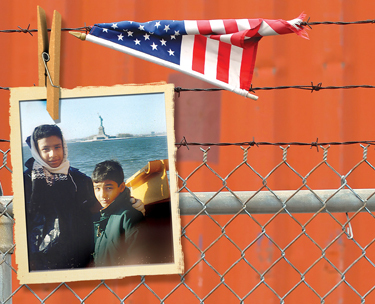 Hossain lived in the United States with his family for more than a decade, and had he carried his green card to Mexico that day, he would now be a citizen, like the rest of his immediate family. Instead, a confused run-in with a border guard landed him with a charge that leads directly to deportation — under one of a batch of laws Congress has written in recent years that have built a massive deportation dragnet. Hossain was among 319,000 people deported in fiscal year 2007; last fiscal year, the Obama administration deported a record number of people — more than 390,000. Two years into the Obama presidency, however, no bipartisan support for a broader bill has emerged from this hawkishness — in fact, the few Republicans who once backed immigration reform have fled. Worse, the Democrats’ would-be political trading game conceals a larger, more troubling fact: Even if the strategy eventually works, the “comprehensive” scheme Obama supports could undermine its own objectives with its indiscriminate deportation policies. The enforcement programs that Obama supports are supposed to target immigrants convicted of serious crimes and to stop guns and drugs from crossing the border. The reality is that they are driving a system that’s come unhinged. 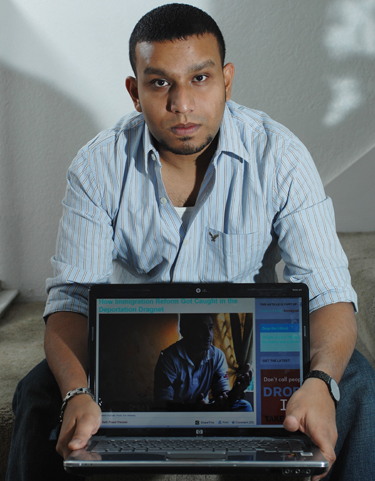 In the three years since Hossain was expelled from Texas, well over a million other people have been removed from the U.S., including thousands deported with no regard for their ties to the U.S. or their immigration status, and often with no legal representation, no actual due process of law, no hearings, and precious little discretion allowed for judges. It was an early Saturday afternoon in October 2006, and Shahed Hossain had just finished a hard week of remodeling kitchens down in Laredo. Before heading back north, Hossain and his boss, Pablo Orozco, and co-worker Daniel Kilos thought they’d make a quick trip over to the other side. In his 11 years in Texas, Hossain had never been to Mexico. Plus, Orozco had a box of empty Mexican Corona bottles to exchange for a full crate. So Orozco got his beer, and they drove back to the border. 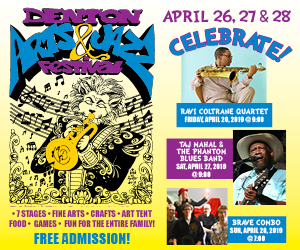 At about 2:15 p.m., after waiting in a short line of cars, Orozco rolled down the driver’s side window and pulled his American passport and Hossain’s Bangladeshi passport and Texas driver’s license from the glove compartment. The border guard peered into the van, first at Orozco and Kilos in the passenger seat, and then into the back seat at Hossain. 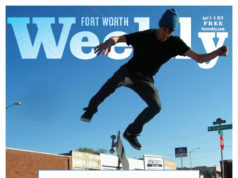 He handed Orozco his passport back and Kilos, a citizen, explained that he’d left his at home in Fort Worth. Then the officer held up the Bangladeshi passport and asked to whom it belonged. Orozco gestured over his shoulder to Hossain. Orozco was told to wait in the car, while Hossain and Kilos were directed into an office. Inside, the two young men were led into a small room by a border guard whose chest badge read Gambaro Valvidias. After patting them down, Valvidias asked the two young men if they were citizens; they quickly responded, together, that they were. Valvidias asked Hossain how he’d become a citizen and, according to Valvidias’ account, Hossain said he did not know because his father had done all the paperwork. But in the process Hossain realized he’d misspoken and corrected himself. “No, hold up, no, I’m not a citizen, I’m a resident, sir,” Hossain remembers saying. Valvidias checked Kilos’ Social Security number through an immigration database and the FBI’s crime database and sent him to wait in the van with Orozco. When he ran Hossain through the system, it confirmed he was a lawful permanent resident. It also showed that two years earlier, before Hossain was issued a green card, he’d been convicted of two misdemeanors for shoplifting, according to his lawyer. He was 19 at the time, and the mischief had not barred him from getting his green card. 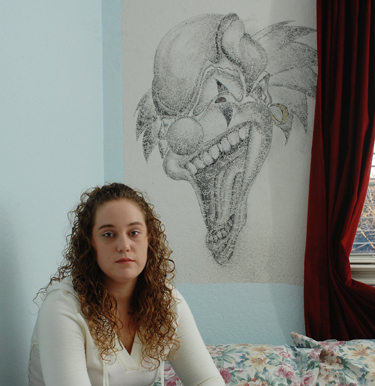 But the record was stored in the FBI’s system, and it raised Valvidias’ eyebrows. The officer asked Hossain why he hadn’t brought his green card, and Hossain explained that his parents had it. An hour and a half later, Valvidias’ shift ended, and he left. When the door opened again a few minutes later, a bald man whose badge said Officer Garza sat down across the table. “You know, you’re very smart,” Hossain remembered Garza saying in a voice filled with contempt. “You tried to say something just so you can get past the border.” Looking at Garza, Hossain repeated that he’d made a mistake when he’d said he was a citizen. But the border guard was already filling out a form. In Garza’s account, Hossain had tried to connive his way into the country. Hossain was bused six miles across the city to the Laredo Processing Center, an immigration detention facility run by the Corrections Corporation of America, the country’s largest for-profit prison company. In the Hossains’ living room on a shelf near a commemorative plate of President Obama is an unframed photograph of Shahed and his brother standing on the deck of the Staten Island ferry. It was taken just days after they arrived in the U.S. The boys are wrapped in winter coats and scarves. Behind them, on the horizon, is the Statue of Liberty. For the boys’ father, Quazi, the loss of his son is an incomprehensible injustice, irreconcilable with the vision he’d had for his family when he was granted asylum. In the evenings now, when it’s quiet at the Destiny gas station, where he works as an attendant seven days a week for $8 an hour, he slips into tears. “It’s really tough to make people understand that a kid, when they grow up here — it’s really tough for him to understand what is the difference between citizen and the resident,” says Quazi, who’d been known as a stern dad. He lets out a quiet moan, his eyes grow wet, and he drifts off somewhere. Fierst, whose blonde curls frame her round girlish face, picks up the thought her boyfriend’s father couldn’t finish. “It didn’t matter,” she insists. A decade and a half ago, Congress created a new category of immigration violation that made it a crime for immigrants of any status to claim to be citizens. The law was intended to prevent undocumented immigrants from lying to get a job or enter the country without a visa. It wasn’t supposed to target green-card holders like Hossain, but as with all of the beefed-up enforcement initiatives federal officials have launched since then, the law is a blunt tool. So Hossain was charged that day with making a false claim to U.S. citizenship. The charge triggers automatic deportation. The false-claim provision is just one small part of a seismic shift that’s taken place in immigration enforcement over the past 15 years. That shift was advanced by an ascendant Republican Congress and accepted by the Clinton White House. And it generated a lasting, if troubling, political consensus about immigration among D.C.’s liberal reformers. So, with an ironclad immigration enforcement infrastructure in place, Sharry and other immigration reform advocates embraced a different Democratic approach: Accept the draconian enforcement measures as water under the bridge but insist they be tied to, or at least closely followed by, a pathway to citizenship for undocumented immigrants. Fourteen years later, no path to citizenship has emerged, and deportations have continued skyrocketing. The last time undocumented immigrants were able to apply for legal status in large numbers was in 1986. President Obama has said he would like to change that, but he’s held steadfast to the Democrats’ strategy of compromise. And some of those who once heartily embraced that approach, including Sharry, are now saying they’ve been had — that Democrats let the enforcement train go way too far and got nothing in return. The Immigration Reform and Individual Responsibility Act, passed amid the 1996 storm, continues to be the main driver of an increasingly unforgiving immigration system. Perhaps most crucially for Hossain, the bill stripped immigration judges of all discretion in cases that involve a long list of violations. “Discretion shifted from the hands of immigration judges,” said Rachel Rosenbloom, an immigration law professor at Northeastern University. “If the government wants you deported, there’s little room for relief.” Formerly, the individual circumstances of immigrants’ lives — family, property, the amount of time they’d lived in the U.S. — could have provided judges reason to stop a deportation. No longer. Knowing little of the rigidity of the system Shahed had been cast into, his family didn’t realize the gravity of his situation. The night Shahed was booked into the detention center he called his brother’s cell phone. Since detainees are not guaranteed legal counsel — most of the 383,524 people detained last year have limited or no legal representation at all — the Hossains hired their own lawyer. To pay the fees, they went deeply into debt, accepting loans from friends and racking up $10,000 on credit cards. Hossain’s defense relied on convincing the immigration judge that what had happened at the border did not amount to a false claim to U.S. citizenship, that it was a mistake he’d promptly corrected. In early January 2007, after he’d been in detention for three months, Hossain’s case was scheduled for court. Twice, the hearing was postponed, once because the Department of Homeland Security listed Hossain as a Mexican national. Finally, six months after he’d been jailed, Hossain appeared in a San Antonio courtroom. The hearing began with the government’s first witness, Valvidias, who explained that Hossain had called himself a U.S. citizen and then retracted the statement, consistent with Hossain’s own account. But then Garza took the stand and repeated the more ominous narrative he’d written in his report. In this account, Hossain repeatedly claimed to be a citizen and didn’t retract the statement until officers challenged it as a lie. Toward the end of the short hearing, Hossain took the stand. The young man, who was known as an outgoing guy, who could befriend anyone, spoke in a timid, unsteady whisper. Three times, Hossain had to be told by the judge and the government’s lawyer to raise his voice. “What would you like to say?” the judge asked. “Your honor, when they asked us, I was nervous,” he said, his voice louder than before. U.S. immigration courts are overwhelmed to a point of exhaustion. In June there were almost 248,000 cases waiting to be heard, a record-setting backlog that means the average wait for detainees facing deportation is 15 months. Without judicial discretion, already overwhelmed judges become operators of a conveyer system. Once the judge was convinced that Hossain had intentionally called himself a U.S. citizen, there remained no space to consider the fact that Hossain’s whole life, all he knew and his entire future, were just a few hours’ drive north of that San Antonio courtroom. had welcomed them was now tearing them apart. “I made a mistake on a word, which I corrected myself right away. I think over a year in [detention] paid for that,” Hossain said recently. But in immigration proceedings, punishment is not individually crafted to fit the violation. Either you get deported or you don’t. Now the Obama administration is predetermining the fate of hundreds of thousands more. In March, a leaked ICE memo confirmed that the agency had set quotas for deportation: 400,000 this year. After the leak, ICE Director John Morton denied that the quotas exist. Regardless, the agency came within several thousand of meeting its alleged target. Obama’s record-setting level of deportation results from his expansion of many of George W. Bush’s most controversial enforcement policies. 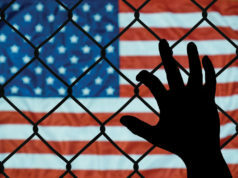 In 2002, then-Attorney General John Ashcroft issued a memo radically shifting the balance of immigration enforcement by granting states “inherent authority” to enforce federal immigration law. Building on the immigration laws enacted in 1996, the memo began a devolution of immigration enforcement to localities by deputizing local cops as immigration agents, through what’s called the 287g program. Suddenly a simple traffic stop could land a non-citizen in detention. In Bush’s last year in office, the toll of deportations rose to 359,000. The Obama administration has continued driving that number upward. It expanded the 287g program to new jurisdictions and has vastly expanded a program called Secure Communities, which checks the immigration status of people booked into local jails. Earlier this year, the president announced his intention to implement Secure Communities in every jail in the country by 2013. It already operates in jurisdictions in at least 33 states. In late September, the entire state of Texas adopted the program. Secure Communities is, however, just one of an arsenal of programs in an out-of-control system. A five-year-old border-region program called Operation Streamline is another example. As National Public Radio reported in a recent investigation, the program shuffles groups of several dozen detainees before immigration judges who issue mass criminal sentencings. There exists nothing like it in all of the American judicial system. There are no individual hearings and no real opportunity for appeal. In unison, groups of detainees take guilty pleas and as a result are pegged with criminal records. It’s another purportedly targeted program that’s actually spraying shrapnel. In 2006 and 2007, as Hossain’s case inched toward his deportation, U.S. Sen. Ted Kennedy crafted an immigration reform bill that would have opened a pathway for many undocumented immigrants to gain lawful status. To gain support from then-moderate Republicans like senators John McCain and Lindsay Graham, the legalization provisions were coupled with harsh enforcement rules, in keeping with the “comprehensive” reform framework. The bill was written and re-written, its enforcement provisions growing heavier as it moved ahead. In the end, it still failed spectacularly. Tactaquin believes that the enforcement “compromise” also helped “shift public consensus against immigration” in general — that the rhetoric was so heavily focused on enforcement that it cast immigration as a problem, rather than as a basic element of the American identity. “Actually getting a better immigration policy is predicated on pushing back on enforcement, not building more,” she argued. on enforcement reform.” But he insists that simply opposing enforcement doesn’t work. Hossain was in detention for another six months before he got an appeal hearing. While he was locked up, other detainees organized a hunger strike in protest of the conditions and of abuse by guards. It was one of a handful of strikes that spread from detention center to detention center across the country. Hossain stopped eating for several days, but mostly he waited for visits from his family. With diminishing hopes of being released, Hossain’s ability to bear his detention cell was fraying. 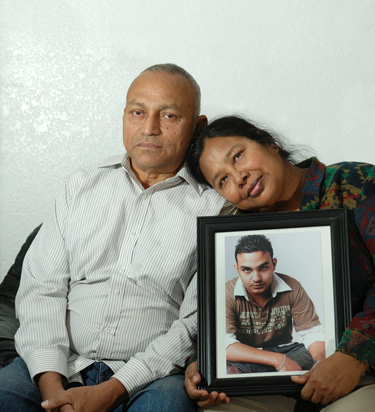 On Aug. 31, 2007, Hossain and his lawyer appeared before the Board of Immigration Appeals. It was a short hearing. He left the courtroom and saw his family waiting on benches. “I just looked at my dad, and he seen my face, and my girlfriend was over there, and she started crying. It was like I died,” Hossain recalled. Ten weeks later, 397 days after he was detained on the border, Hossain was taken from his detention cell, and his ankles were shackled. CCA guards led him onto a bus, and he was driven nine hours to the Dallas-Fort Worth International Airport. Twenty minutes away his family went about their day, distracted in the garden and in the kitchen. The Hossains are still talking to lawyers, looking for a way to get their son home. Fierst thinks that if they get married, Shahed might be able to come back, and there’s some hope that he could apply for a new visa at the U.S. consulate in Bangladesh. In D.C., meanwhile, some signs of the shifting strategic orientation are emerging among Democrats too. In September, Senate Majority Leader Harry Reid made a move in this direction when, under significant pressure from a coordinated and media-savvy movement of students and other undocumented youths, he agreed to push the DREAM Act. The bill would open a path to citizenship for hundreds of thousands of undocumented immigrants who graduate from college or serve in the military. 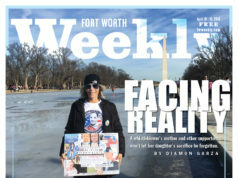 DREAM passed the House last week, and at the time this issue went to press sat precariously in the hands of the Senate. The Republican surge may foreclose the possibility of moving on immigration reform. The rightward shift in Congress and in state governments is likely to further ratchet up immigration enforcement. And unless Obama uses his administrative authority to halt mass deportations, there will certainly be many more Shahed Hossains. 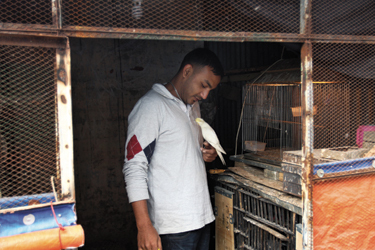 In Dhaka, Shahed Hossain walks into a small room where he keeps a pigeon coop he’s built to pass time. He pulls open the latch, and the birds stream out, their wings flapping furiously. He latches the cage and steps outside, his eyes darting from bird to bird above him as if deciding which one to follow. “They’ll be back,” he says. A version of this story originally appeared on Colorlines.com. Seth Freed Wessler is an investigative journalist for Colorlines.com. Brian Palmer contributed reporting from Bangladesh, supported by the Investigative Fund at The Nation Institute.